20 years ago the first billy cart raced in East Gresford, in those early days we had a few hundred spectators as they watched in awe as homemade billy carts raced down the main road at scary speeds. 20 years later we are still doing exactly the same thing except today we have thousands of people watching in awe as every shape and size billy carts still race down the main street. Over the years we have added so much fun and excitement off the track for the whole family. Where else can you throw a gumboot, spit the dummy, bet where a horse will drop his patty, shop at numerous stalls, drool over classic cars, eat exotic foods or still enjoy our famous RFS BBQ. 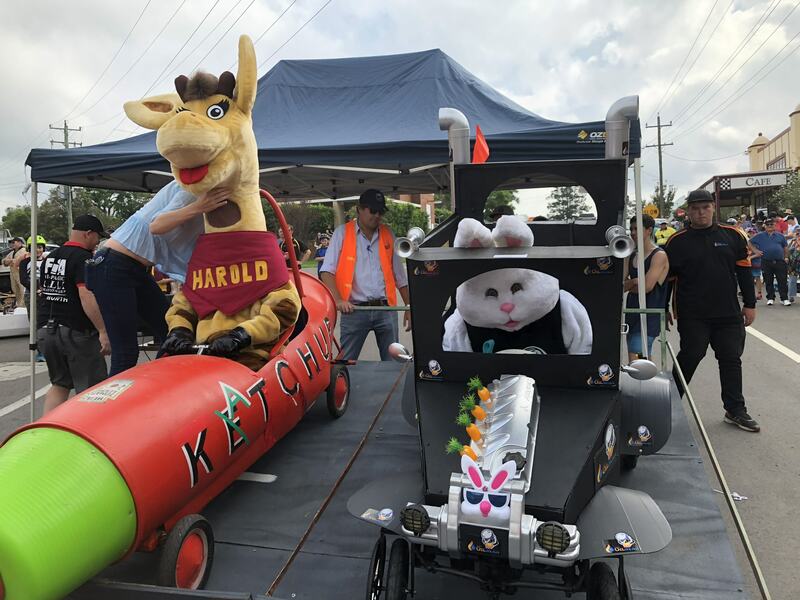 Where else would you pat pet Llamas walking around the markets, sit and enjoy our story time by our children’s author, watch the magic of The Amazing Jonathan and watch the Easter Bunny race Healthy Harold in a grudge match. Only at the Gresford Billy Cart Derby. All money raised goes back to our community.